There are secure permanent or long-term moorings available in the new Droylsden Marina. 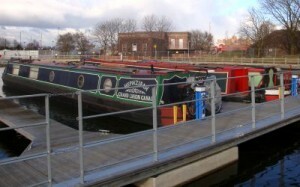 This is situated on the Hollinwood Branch Canal adjacent to Fairfield Top Lock on the Ashton Canal. 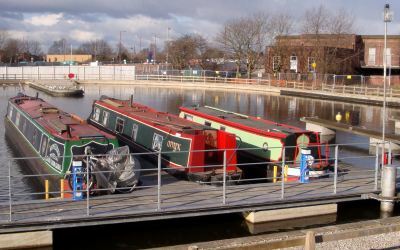 The marina is the centrepiece of the Droylsden Wharf development, which is in the course of construction. Droylsden Marina is managed by Portland Basin Marina. For information about availability and prices, please contact us on 0161 330 3133. Electrical power available metred to every boat. Water supply to the pontoon. 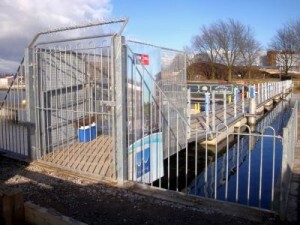 Lock-in secure access to pontoon. Elsan disposal nearby at Fairfield Junction. Replacement gas bottles can be supplied. Short-term or overnight mooring may be available subject to room. Post office and shopping centre nearby. Frequent buses to Manchester and Ashton nearby. Metrolink tram to Manchester and Ashton nearby. The marina is situated at the start of 9 miles of lock-free cruising on the Ashton and Lower Peak Forest Canal to Marple Aqueduct. It is adjacent to the Cheshire Ring and South Pennine Ring. Diesel, chandlery and dry dock facilities are available at our main base at Portland Basin Marina, under an hour’s cruise away.